WAR GODS, volume one, begins at the edge of Rome at the gates of Persia, where lies a killing ground where a bloody stalemate between ancient superpowers is causing chaos. For those caught in-between them there are feats of bravery, cowardice vengeance and betrayal.... This is the world as Rome begins its fall and the Dark Ages loom on the horizon. Where the new beliefs compete with old entrenched Gods. This is the world East of Byzantium. This printing is a limited special edition of the 301 A.D. story arc from the ongoing digital release. 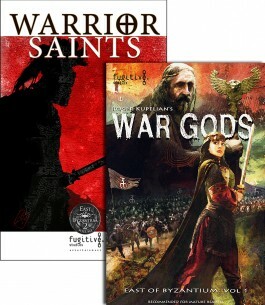 WARRIOR SAINTS, the second volume of the East of Byzantium series created by Roger Kupelian and his team, picks up 150 years after where the first volume, WAR GODS left off. Vartan Mamigonian and his followers battle superior odds, as the first Christian Kingdom of history becomes the first to fight to defend it. With lavishly painted art using his own technique of combining analog and digital techniques, Roger Kupelian has created a ruly epic look at the world of the 3rd through 5th centuries as seen through the lives of men and women caught between thet great superpowers of the day, Rome and Persia.